Kim Kardashian and Kanye West’s daughter is barely a week old, and little North “Nori” West is already a household name. Yet despite endless commentary about the unconventional moniker, the literary origins of North West have yet to be revealed. The obvious association is Hitchcock’s beloved film, North By Northwest, but this title is actually derived from Shakespeare’s Hamlet: “I am but mad north-north-west. When the wind is southerly, I know a hawk from a handsaw,” Hamlet muses to Guildenstern. In modern English, the troubled Prince of Denmark thinks he’s one fry short of a Happy Meal when the breeze blows north or north-west. Is Kimye aware of the literary connotation of their baby name? Probably not, or they wouldn’t have associated their daughter with mommy issues and madness as fickle as the wind. The unique name, and its surprising Shakespearean association, bring up a fascinating question about the cultural legacy a baby inherits solely based on its name. background. Is it any surprise that literary names like Phineas (A Separate Peace) and Atticus (To Kill a Mockingbird) have taken off in recent years? Who doesn’t want to bestow upon their child a Pavlovian response from strangers who automatically find their child attractive, wise, honest or dignified because of a book they read in ninth grade? And would an ironic little hipster like Ebenezer be the equivalent of naming a child Miser or Greed? (There actually are 70 people named Greed, according to the Census). I won’t even ask about Quasimotos. Somewhere in Brooklyn, there may be one being born right now. Interestingly, for girls the names of precocious and whimsical yet feminine characters like Matilda, Madeline, and Alice have become perennial favorites — but not their feistier and more assertive literary sisters, Pippi and Eloise. I guess most parents don’t want daughters sliding down banisters and rejecting basic social norms. It’s no wonder the names of strong women in literature — Tolstoy’s Natasha, Morrison’s Sula, Larsson’s Lisbeth — carry a certain lyricism, fierceness, and sensuality that make them both intriguing and dangerous. Often these characters come to be known more closely than the hefty volumes they inhabit. Which brings up another trait of literary naming: the cannonical tip of the hat. Claire Messud’s dollhouse-crafting Nora in The Woman Upstairs is clearly piggybacking on Nora in Ibsen’s A Doll’s House. In doing so, Messud invokes the magic of her literary ancestors and creates depth of character before the book even begins. On that note, could any writer name a character Holden or Nathan without readers thinking the author was referencing Caulfield or Zuckerman? Perhaps names in the titles of books — especially those from childhood — have the most lasting influence over how these names are perceived. Harriets must always wear glasses and are probably undercover agents; Annes are plucky and face difficult obstacles in faraway places like Green Gables and Amsterdam. Sheilas, well, they’re just great. There’s the rare situation where the overwhelming popularity of a name can all but erase its literary connotations. The influx of Emmas (it was the second most popular baby name in U.S. for girls in 2012) has totally diminished its relevance to Ms. Bovary and Ms. Woodhouse in my mind. The first time I read The Merchant of Venice, Shylock’s daughter Jessica threw me for a loop. I thought her name simply didn’t have enough gravitas for Shakespeare, since it is one I associate with popular blonds and B-list actresses. Some names are just plain obvious in their symbolism. Name a character Adam if you want him to be an everyman. Marys and Maggies are innocent and likely to get devoured in sci-fi or deflowered in literary fiction. Katherines, and now Katniss, are heroine types. Just as certain names in literature connote good and others evil, the concept is fairly often seen off the page too. The suggestion that Tamerlan, a common name in the Caucuses, be retired after the Boston Bombings was a culturally tone-deaf suggestion, but it spoke to the type of personal biases that many of us have with names. I admit to initially feeling slightly prejudged against guys with the same name as certain ex-boyfriends, and when I first started dating my current boyfriend, Lenny, the only other Lenny I knew was the protagonist in Super Sad True Love Story. I couldn’t help but wonder if I was setting myself up for heartbreak (We’re doing just fine, thanks.). North West is what’s being called a concept name. Will it spawn a generation of Word Smiths and Harry Pitts? Putting Green? Old MacDonald? Cupcake Baker anyone? Names might carry the baggage of their literary predecessors, but what about a phrase? Little North’s legacy will likely be shaped by so many other factors, and to suggest a child’s destiny is exclusively shaped by his or her name is bunk. My prediction is that North West will be a force of nature. After all, wasn’t it the Bard who said a rose by any other name would smell as sweet? How Can Historical Fiction Be Feminist? Relative to the inexpensively priced cost of a 15 day rail pass, the amount of publicity generated by a few tweets about “free” train travel is extraordinary. Esp. given how totally uncomfortable rail travel is in U.S. 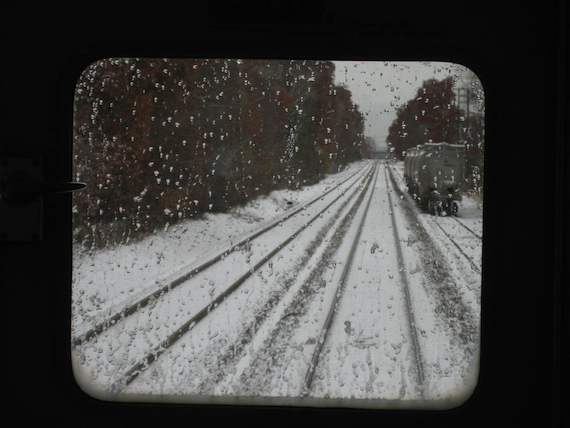 I guess I was on the vanguard of something because a few years ago, I took the train around the country and it was one of the most miserable experiences of my life: trains are cold, the conductors on power trips & other passengers are (generally) psycho. It’s curious that Amtrak’s offer doesn’t specify whether these tickets are coach or rooms. The latter comes with meal service, showers, etc. The former are reclining seats that are comfortable for a comfortable hours, but almost impossible to sleep or work in for any length of time. Regardless of class, the cold recycled air, though, is the major drawback of long-haul train travel and I knew no one who lasted longer than 2 days w/out getting sick — or assaulted by the can-be hostile passengers. The idea of “writing” on Amtrak, though that wasn’t my goal, strikes me as not so much fanciful, as fantasy. Sure, there’s a sense of movement and the scenery of this country is amazing but other than that … & the food is terrible. James Ross published just one novel in his lifetime. This is a rare thing because of a paradox that lies at the heart of novel writing: it demands such sustained focus, such persistence, so much raw pig-headed stubbornness that anyone who does it once almost invariably does it again.